“The longtime ruling party of Canada’s energy-rich Alberta province lost its four-decade hold on power on Tuesday, ushering in a left-leaning government that has pledged to raise corporate taxes and increase oil and gas royalties. “The Alberta New Democratic Party swept enough districts to form a majority, taking most of the seats in both the business center of Calgary and the provincial capital of Edmonton, according to preliminary results from Elections Alberta. 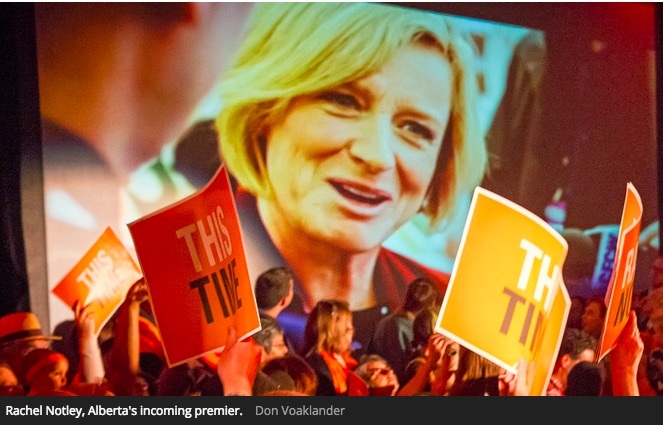 . .
“The NDP has long been a marginal force in Alberta’s traditionally conservative politics, but recent public opinion polls showed its popularity surging. In the campaign, Ms. Notley attacked Mr. Prentice for reinstating provincial health-care premiums and being too cozy with oil-patch interests. “In a move that spooked some energy company executives during the campaign, Ms. Notley raised the specter of increasing royalties levied on oil and gas production, although she said that her party would only consider that once crude-oil prices recovered from recent lows. See the comment below. CPNN readers are encouraged to add to this discussion. The vested interests of companies and governments are usually ignored by the mass media who are part of the problem, since they are linked in financially and they control the news in order to avoid criticizing them. But this week there was a breakthrough. The Guardian Newspaper in England finally published some of the facts about the subsidies given by governments to the big oil companies. A proposed Shell petrochemical refinery in Pennsylvania is in line for $1.6bn (£1bn) in state subsidy, according to a deal struck in 2012 when the company made an annual profit of $26.8bn. The deal was struck by the then Republican governor, Tom Corbett, who received over $1m in campaign donations from the oil and gas industry. ExxonMobil’s upgrades to its Baton Rouge refinery in Louisiana are benefitting from $119m of state subsidy, with the support starting in 2011, when the company made a $41bn profit. The Republican governor of Louisiana, Bobby Jindal has expressed his pride in attracting investment from ExxonMobil. In state election campaigns between 2003 and 2013, he received 231 contributions from oil and gas companies and executives totalling $1,019,777, according to a list compiled by environmental groups. A jobs subsidy scheme worth $78m to Marathon Petroleum in Ohio began in 2011, when the company made $2.4bn in profit. Republican governor John Kasich said in 2011. “All we’re doing is helping them.” In 2011, Kasich was named as the top recipient of oil and gas donations in Ohio, having received $213, 519. Oil Change International, an NGO that analyses the costs of fossil fuels, found in 2014 that US taxpayers were subsidising fossil fuel exploration and production alone by $21bn a year. By the way, I believe it was also the Guardian newspaper than dared to publish the revelations of Julian Assange and Edward Snowden about corrupt and illegal government practices.